Entry level solution for those with a small multiroom system, in residential or commercial premises, up to 4 TV points. 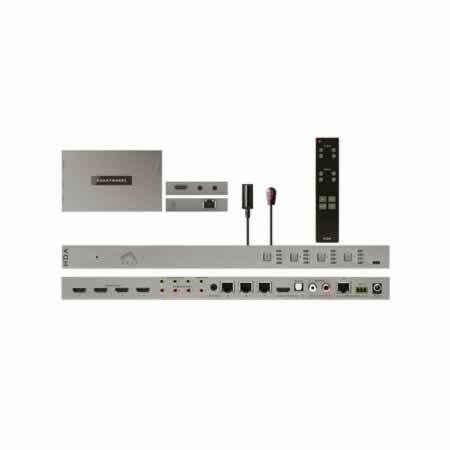 MHUB 4K is a centralised AV multiroom system for sharing four Ultra HD HDMI sources to four screen locations, three long-range via a network cable, which can be up to 40 metres in length for UHD, or 70m for 1080p and one closer screen via a HDMI cable. 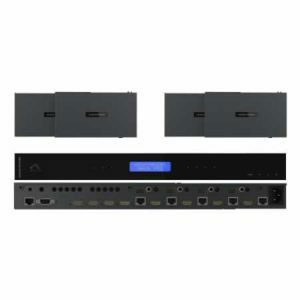 The system comprises of a central hub, where all HDMI sources are connected and three palm-sized, easily-hideable lightweight receiver units, which sit behind each screen and drawing their power from the central hub, so no bulky wall PSU or USB 5v cables are required. 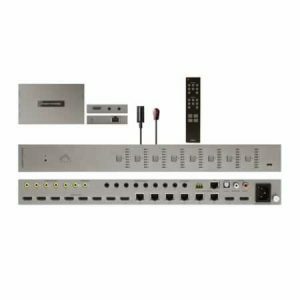 An integrated system of IR blasters and receiver dongles allows for full control over all the hub-connected HDMI sources and all screens at all locations – great for universal remotes and other control systems*. *ready-made drivers included for all major control systems free of charge. HDCP 2.2 support. 2-year standard warranty plus an extra 1 year when registered on the HDA Cloud . MHUB 4K is available for domestic and commercial installation on new or existing networks in and around London. Contact London SatMan for more details.